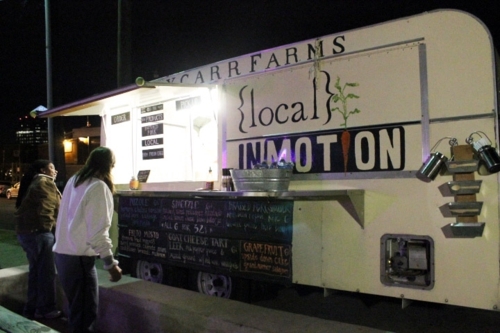 The Boxcarr Farms food truck can be found at Fullsteam most Thursday nights, which is where we found it a few weeks ago. They offer food made from Boxcarr Farms wares and those from other local farms, and let me tell you, it all sounded pretty darn delicious. I’m super excited to see that they offer breakfast, brunch, and lunch menus, too. For dinner, small plates are on the menu, and they are each priced at $6 along with a dessert option. 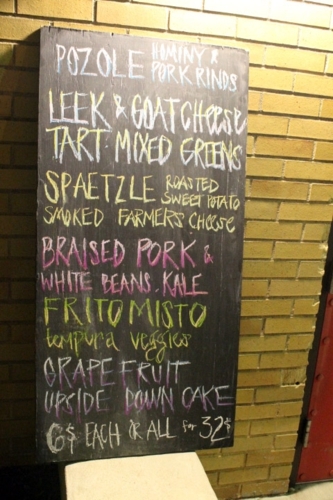 The menu changes often, depending on what ingredients they have available. 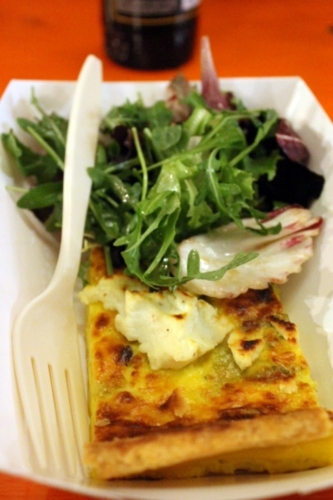 I love leeks, so I went for the leek and goat cheese tart served with mixed greens. The salad was dressed with a light vinaigrette that tasted great though a heavier vinegar presence would have been nice. The tart was amazing. It was a long, thin slice with plenty of buttery richness. Most importantly, the leeks could be tasted with every bite, and they’d been roasted nicely to enhance their flavor. Loved the tart. My dessert, the grapefruit upside-down cake, was more of an adventure in dining. I love pineapple upside-down cake, and this fit that bill well, but ultimately, the grapefruit’s bitterness didn’t work for me. Of course, I knew it would be bitter, but I had to try it anyway! 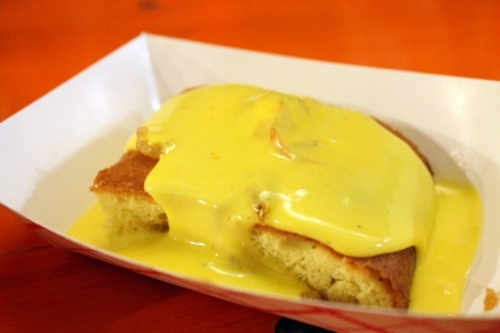 The cake itself was super moist, and that yellow sauce was sweet, creamy, and essential for cutting through the bitterness of the grapefruit. Did I eat it all? Absolutely! But I probably wouldn’t order it again. Despite my aversion to the dessert, there’s no question that the Boxcarr Farms food truck offers quality food with exceptionally fresh ingredients. And I always think experimentation is worth rewarding, even it if doesn’t always work out.